Pen + Brush is a 122 year old art organization that provides a platform to showcase the work of female artists and writers to a broader audience with the ultimate goal of effecting real change within the arts marketplace. They encourage and mentor emerging professionals and aim to expose the stereotypes and misconceptions that perpetuate gender-based exclusion, lack of recognition and the devaluation of skill that is still experienced by women in the arts. 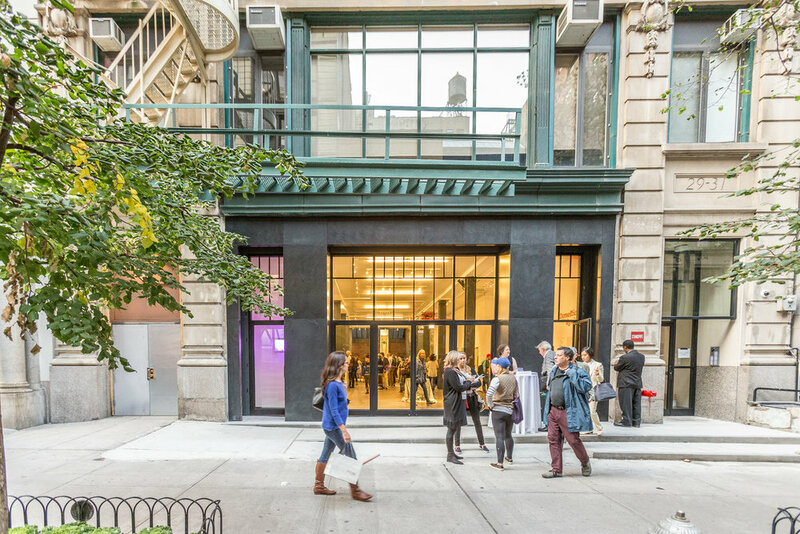 When Pen + Brush chose their new space in the historic Flatiron District, they commissioned us to create a flexible space that would pay homage to the history of the organization while being able to accommodate the needs of artists today. We were tasked with creating a space that could easily adapt to different settings including intimate book readings, performance art and visual art exhibitions. One of the ways this was accomplished was by opening up the lower level by excavating the basement to allow for additional exhibition space. The open stair below the expansive skylight allows natural light to penetrate multiple floors and is used as a visual anchor in the space. Special care was taken in highlighting original elements of the 1906 building including exposing the original steel columns and brickwork. At the entrance, back-lit channel glass was used to create a glowing, interactive portal that gives Pen + Brush a prominent street presence and welcomes the casual passersby to come explore Pen + Brush's unique offerings.